Chris Patten, born 1944, was educated in St Benedict’s School, Ealing, and Balliol College, Oxford. He had worked in the Conservative Party since 1966, starting in ist research department. He was a member of the British House of Commons from 1979 to 1992, 1983-1985 Parliamentary Under-Secretary of State in the Northern Ireland Office, 1985-1986 Minister of State in the Department of Education and Science, 1986-1989 Minister for Overseas Development and 1989-1990 Secretary of State for the Enviroment. He was also Chairman of the Conservative Party and the Duchy of Lancaster from 1990 until 1992. In July 1992, he became the 28th and last Governor of Hong Kong until its handover to the People’s Republic of China in 1997. 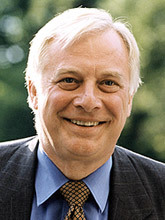 Chris Patten was the only professional politician taking the job as Hong Kong Governor. In 1999 he was appointed one of the United Kingdom’s two members of the Commission of the European Communities, responsible for External Relations. He is the chancellor for the universities of Newcastle and Oxford.